Message | NATTO Co., Ltd. The possibility of natto with a history of over 2300 years is infinite. Believe that possibility and contribute to people, Japan, the world, and the universe. That is our eternal theme. Bacillus natto has the potential to solve problems around the world. By keeping pursuing that possibility, people and the earth become healthy. We will continue to be a company that is needed around the world, centered around Bacillus natto. 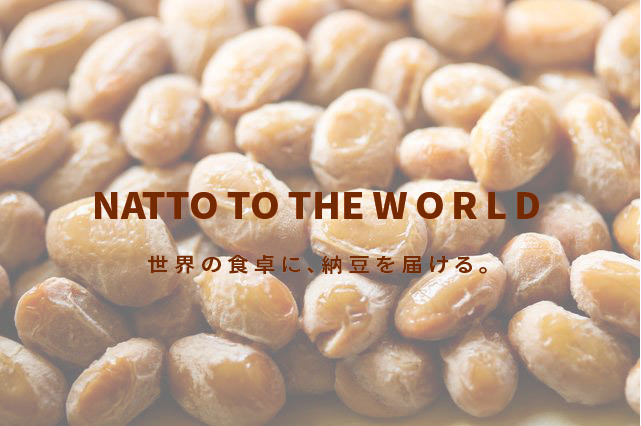 Natto can connect people all over the world. Fermented foods born in Japan, an island country, can eat around the world. We will continue straight, obediently and sincerely until we can realize it. We make the most of our excellent brains and create new value. As a result, smiles and emotions continue to increase all over the world on a daily basis. We don’t regard it as one food, we make use of various ideas and all kinds of technology to jump over the frame of common sense. In order to make a new future where people are happy, we will act natto, Bacillus natto, human beings, the earth, the universe and acting on a global scale.